Knights of Honor is a real-time strategy (RTS) game developed by Bulgarian Black Sea Studios (now Crytek Black Sea). It was published by Sunflowers GmbH in Europe in 2004 and Paradox Entertainment in North America in 2005. The game takes place in Medieval Europe, spanning the early centuries of the second millennium in three historical time periods. 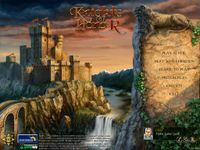 The player can choose to play as one of over 100 playable kingdoms. Source: Wikipedia, Knights of Honor (video game), available under the CC-BY-SA License.